Fourteen players are being tied for the first place with the perfect score in the Reykjavik Open after 3 rounds. The 2700+ trio have lost only half-a-point overall - in round 3, David Navara got a difficult position after a mistake in the opening but managed to get away with the draw vs the host IM, Jon-Viktor Gunnarsson. The biggest sensation so far is the result of English FM Daniel Bisby who has defeated two much higher-rated opponents, GMs Sergey Movsesian (Armenia, 2665) and Axel Rombaldoni (Italy, 2488). Both victories happened yesterday, the only day with the doubled rounds. Daniel Bisby, who is now among the leaders with 3/3, is not some young promising player, as he will turn 37 in September. Nevertheless, both of his wins look quite logical and impressive rather than being some lucky shots. 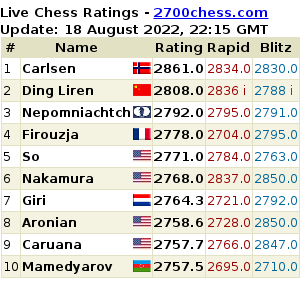 Meanwhile, it's not that often that a 2300-rated played gets a chance to face GMs like Sergey Movsesian (who had enjoyed the peak rating of 2751 in 2009). In this connection, Topalov's opinion expressed in the beginning of the Gibraltar Masters comes to mind. Why shouldn't we think in the direction of having more top players in open tournaments, instead of isolating them in the closed Grand Prix series or some Baden-Badens? 20.d4!? (a brave breakthrough; 20.Bg5 is a more solid allternative) 20...cxd4?! It seems the most principled line is 20...Bxb5 21.Rxb5 Nxd4 22.Nxd4 Rxe5 with complications. 21.cxd5 Kf8? Black chooses the 'safest' way again, but allowing the pawn to d6 is strategically bad. After 21...exd5 White has a number of tempting ways but the things would have remained unclear. 22.d6 Rb8 23.a4 Nxh4 24.Nxh4 Rxh4 25.Bg5 d3 26.Qxd3 Rxa4 27.Qh3! Kg8. Taking the knight loses due to 28.Qh7 with the threat of 29.Be7+, but now Black's position is also quite dour. 28.Nc7 Rxb1 29.Rxb1 Bxe5. This loses on the spot, although 29...Bc8 30.f4 is just a longer way to be defeated. Among the games of the starting three rounds, the following bizarre miniature catches the eye. It took Black only 8 moves to win! 1.e4 c5 2.Nc3 Nc6 3.Bb5 Nd4 4.Nf3 e6. 5.Nxd4? White must have confused something, as she certainly had a number of playable alternatives, 5.0-0 to begin with. 5...cxd4 6.Ne2 (6.Nb1 Nf6 is also in Black's favour) 6...Qg5! Strangely enough, several strong players, including Smirin and Inarkiev, have refrained from this double attack in their games. 7.Nxd4? The only idea this line could be played with is 7.Bd3 (or 7.Bc4, 7.a4) 7...Qxg2 8.Ng3 Qh3 (otherwise the queen will be trapped) 9.c3, although Black should be fine here. 3 rounds are over in the Australian Open which is under way in the suburb of Sydney. So far, 6 players have got the perfect score: Ni Hua, Murtas Kazhgaleyev, Eugene Schon, Steven Yap Kim, Gregory Canfell, and the incumbent Australian champion Max Illingworth. A group of 12 players including 5 GMs have 2.5/3 (see complete current standings). Magnus Carlsen is not in his best shape at the European Team Chess Championship taking place in Reykjavik, Iceland. After two days of rest, the World Champion joined his team in the match against Armenia. He lost against Levon Aronian as White. The next day he drew Sune Hansen of Denmark, who by the way defeated David Navara in Round 1. Yesterday Carlsen lost against Yannick Pelletier of Switzerland. Again as White! The victorious row of the Georgian women's team had lately equaled to eighteen matches. The first eight wins were collected during the World Team Championship, other seven were gained just recently in Skopje, where the Georgian club Nona was represented by almost all the national team players. In Pardubice, Czech Republic, the main event was the open tournament A, which had 289 players including 35 GMs. The first two places were occupied by the salient rating favourites - Viktor Laznicka and Sergey Movsesian. In Nakhchivan, the final round of the Heydar Aliyev Open tournament has just finished. There were several candidates for victory right up to the last day, but all questions were answered by Gadir Guseinov beating Sergey Tiviakov, and Eltaj Safarli overcoming Pouya Idani. 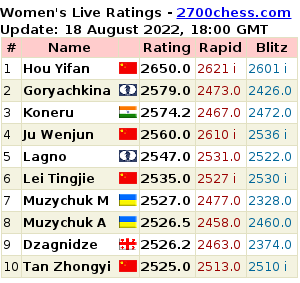 As a result, both Azeri grandmasters scored seven points, but Safarli won overall on tie-break. Here are the heroes' games from the live broadcast.